With The Last Jedi arriving on Digital HD March 13, and Blu-ray and DVD March 27, Disney and LucasFilm have released a brand new alternate scene from the movie, ahead of the home video release. 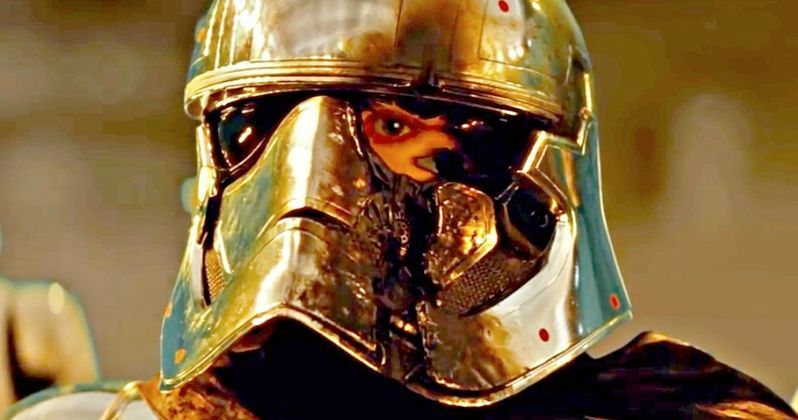 This new scene offers a much different death for the nefarious Captain Phasma, bringing more weight to it than Phasma's demise in the theatrical cut. This alternate scene may have some wondering why this wasn't used in the finished release, given how many fans agreed that the Finn vs. Captain Phasma fight was rather underwhelming. In The Last Jedi, the duel between Finn and Phasma was seen as anti-climatic, with Finn knocking Phasma down in a surprise attack, which breaks the visor on her helmet, exposing her left eye, before the platform crumbles and she falls into the flames below. The alternate scene debuted during this week's episode of The Star Wars Show, which shows Finn brandishing his special weapon while Phasma climbs up onto the platform where Finn is standing, joined by four Stormtroopers who form a perimeter around them. As she climbs up the platform, we can see that, like in the original theatrical version, Phasma's visor is broken over her left eye. When Phasma finally gets to her feet, she calls Finn a "disrespectful, disobedient traitor," which Finn has an interesting response to. He lowers his weapon. Then he proceeds to break down the hypocrisy of the "order" that Phasma seeks, but when her "shiny neck was threatened," she squealed. Finn reveals to these Stormtroopers that while the evidence may be "below the base," Finn and Phasma know the truth, that when Finn had a gun to her head, Phasma disabled the Starkiller Base shields, with Finn pondering what her troops or her masters would do if they found out. While Phasma questions who would believe such a story, the Stormtroopers flanking them certainly seem to. The deleted scene comes to a close with Phasma killing the four Stormtroopers, before turning her blaster on Finn, who attacks with his weapon and continues a long-standing Star Wars tradition of someone's arm/hand being cut off. Phasma manages to fight back and knock Finn to the ground. Before she tries to kill him, she tells Finn that he was, "always scum," to which Finn replies, "Rebel scum," before picking up a large laser cannon and firing right into her chest, sending Phasma into the fire below to her death. While some fans may still think that Phasma was underused in The Last Jedi, this scene at least gives her a much more interesting death. And she's definitely dead. Her fate in the final version of The Last Jedi is still undecided. Director Rian Johnson had stated after The Last Jedi was released that there was never plans to use Phasma in Star Wars 9, and that the character was not utilized as much in this movie because there were simply too many characters in the movie. Phasma has since been featured in Greg Rucka's book Before the Awakening, which fleshes out her character even further, although it seems this may not be the last we'll see her on the big screen. There have been hints that she survived and could return. This is one of 14 deleted/alternate scenes that can be found on the Star Wars: The Last Jedi Digital HD when it arrives March 13, and the Blu-ray and DVD arriving March 2. Take a look at these deleted scene from The Star Wars Show on Star Wars YouTube, which you can see by skipping to the 1:37 mark of the video.